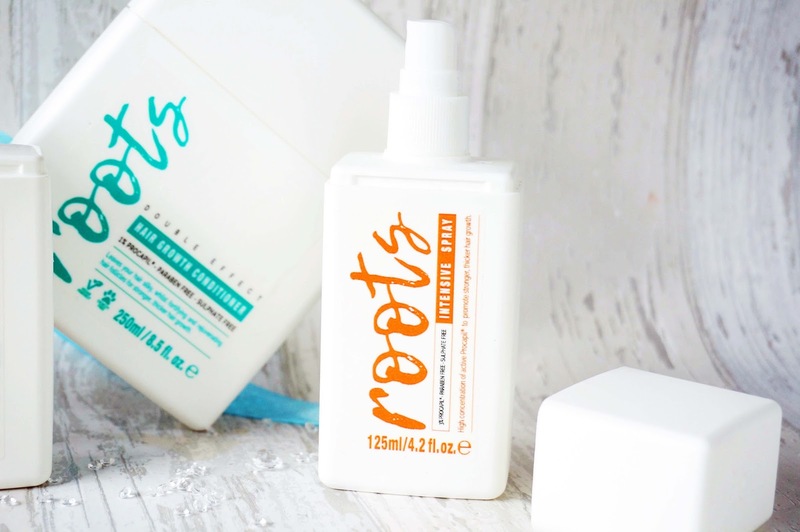 Today I’m reviewing the Roots Double Effect treatment pack that I was kindly sent. Roots Double Effect prevents hair loss by strengthening your follicles giving us stronger hair. It contains Procapil® which is the newest Technology in hair growth and is a natural ingredient known to increase hair growth up to 55%. So does this actually work? 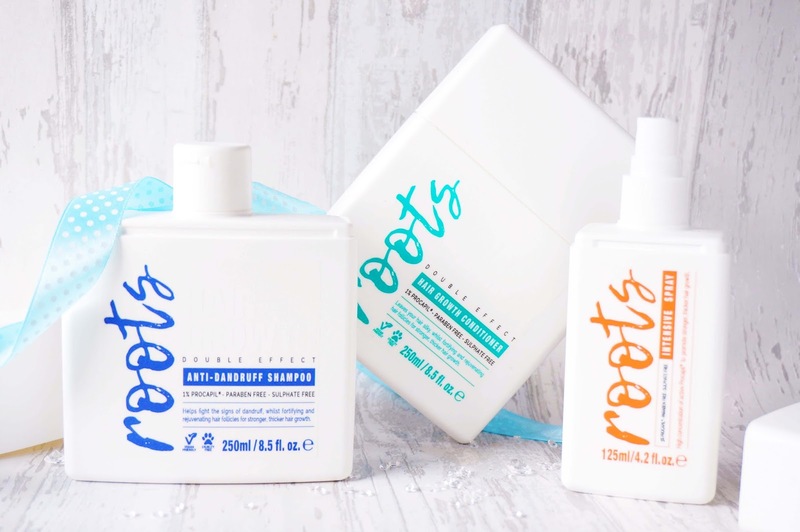 Within the set, there is a shampoo, a conditioner and an intensive spray that helps improve growth and prevent hair loss. There are three different curated sets; the first being for sensitive scalp, the other for oily hair and lastly anti-dandruff. I opted for anti-dandruff since I was dying my hair so often that I noticed I was losing a lot of hair and my scalp was very dry, there's nothing worse than you have almost black hair with white specks all over. All these products are also paraben free, sulphate free and cruelty-free! 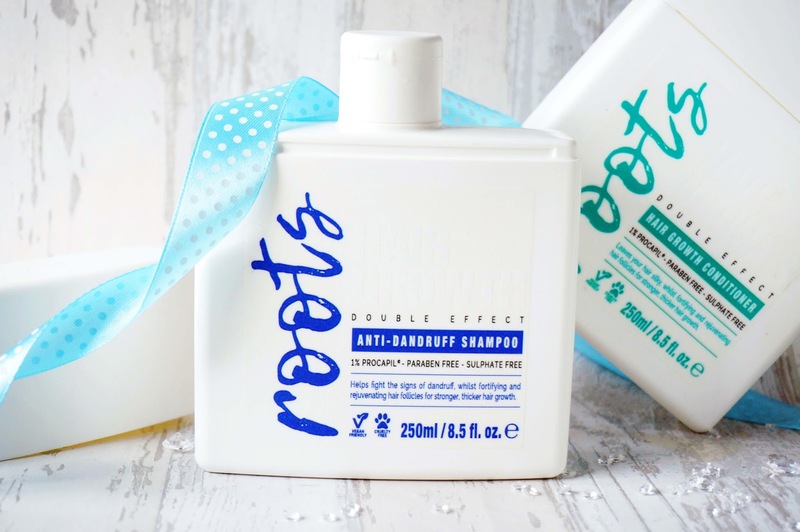 The shampoo and conditioner come in a very slim line bottle which I do find easy to store but it can be a nuisance when you're trying to get the product in your hands when the water is raining down on you. The intensive spray is a handy little size and the nozzle sprays well for an even application. The shampoo has a slight minty scent and feeling on your scalp. It makes washing your hair so soothing if you have sensitive scalp and dandruff I would opt for the anti-dandruff since it has this cooling/calming effect. The product itself lathers really nicely and I focus this on my roots only. I give my head a little massage, it truly cleans my hair and does not strip moisture from my hair either. 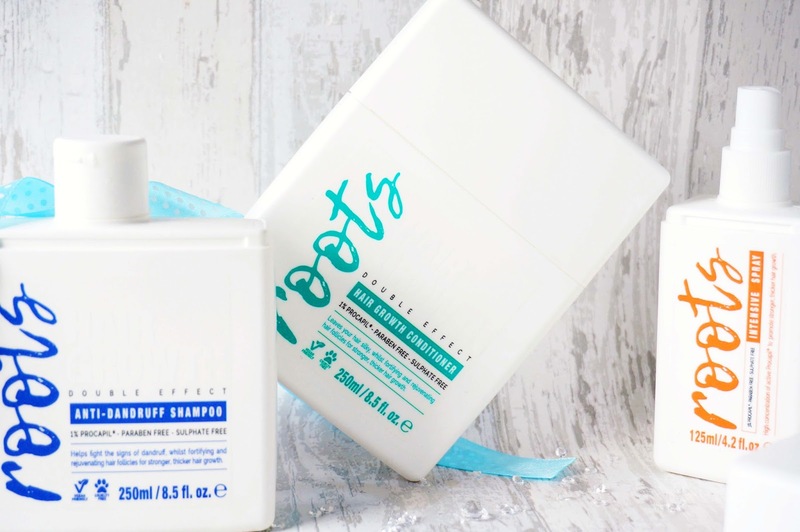 The conditioner has the same refreshing scent and feeling as the shampoo, it’s relaxing and this is when I go in with a tangle teezer to brush the product through my hair. Again I only use this at my roots and it has helped my dandruff so much. For the ends of my hair, I always go in with an intensive conditioner like the Aussie 3 minute treatment since the weather is cold and my ends can be quite brittle. This is the star of the show and is the product that contains most Procapil® (3%) to help with hair loss and growth. When you spray this into your damp hair it has that cooling sensation again and you just work it into your scalp. I mainly focus the on the crown of my head where I feel where most of my hair thinning is. You can use this daily but I only use it after I wash my hair which is only once or twice a week. It doesn’t weigh my hair down - I just think of it as a leave-in conditioning spray. I have seen a huge improvement in the quality and texture of my hair. My hair is more healthy, thicker, stronger and soft, when I brush through my hair in the shower I’ve noticed less hair loss. I started to see these results 4 weeks in but it is more noticeable now. My hair has grown a lot which I can tell from my roots because I do dye my hair and I've only dyed it once during my usage and my grey hairs are visible and long (it's a genetic thing) - I got my brother to measure my hair growth which is approx 42 mm and the average hair growth is 12.7mm a month. I am pretty impressed with these results since I've used these for about 2+ months (8 or 9 weeks right now). Would I recommend? Yes. Will I continue to use these? Yes. The good thing about these is they are available in your local Superdrug. Have you tried these products and did it work out for you? If you need more information head on over to the Roots Double Effect website. These products sound lush! I'm forever looking for products to thicken my hair as it's so damaged from bleach, I'd definitely love to give the spray a try at least as it sounds like the most targeted and beneficial treatment! In the event that your therapeutic master can't do this,website it is possible that you or your specialist can make enquiries and get cites from nearby administrations.